Flats: Bonefish, Permit, Dario Espinosa, a side man and world famous crocodile handler from the Island Ferry, caught a nice Snook. Tarpon are known as Silver King and locally Sabalo. Tarpon are designated a catch and release species. This fish brings in hundreds of thousands of tourist dollars annually to our local economy by anglers from mostly the US on the hunt for this stealthy powerful and acrobatic game fish. Our own “El Pescador” resort is famous world wide for its excellent guides and the outstanding and lengthy record for landing monster Tarpon. Tarpon are famous for their fight. But instead of sulking deep like most fish, Tarpon fight shallow. This allows anglers to use lighter tackle to go after these game fish. 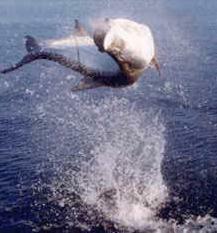 Tarpon run out and jump high. It’s not uncommon to see Tarpon represent their species with amazing acrobatic displays leaping and grey hounding dozens of times before being landed. So strong is this fish that its on record that in 1972 in Florida a landed “green” tarpon killed its angler, from injuries suffered to the mans abdomen and head as the Tarpon thrashed around in the boat. Most Tarpon caught weigh between 40 and 80 pounds but its not uncommon to catch Tarpon weighing well over 100 pounds in Ambergris Caye waters. This month is a big month for huge tarpon. A large number of migratory fish are coming into the area and a lot of the larger resident Tarpon are moving off the shallows and sitting in the cuts on the east side of the island where they feed on large schools, silversides, that congregate around caves and grottos. Most Tarpon caught weigh between 40 and 80 pounds, but its not uncommon to catch Tarpon weighing well over 100 pounds in Ambergris Caye waters. 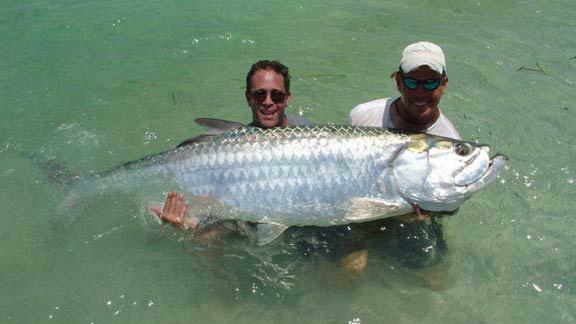 The world record Tarpon was caught in Venezuela and weighed in at 283 pounds and 4 ounces. I myself have seen Tarpon over seven feet long and am quite sure a record holder waits to be caught here in Ambergris waters, quite likely next week by me...I think maybe on Monday. It’s not uncommon to see Tarpon represent their species with amazing acrobatic displays leaping and grey hounding dozens of times before being landed. Tarpon can be caught in a variety of ways. On spinning or bait casting, my favorite is to anchor on the edge of a cut and use big sardines or small mullet on a size four circle hook and float them with the tide three feet beneath a balloon. I like to fish Tarpon when they are rolling at the surface right before the sun comes up in the morning. Usually I’ll chum the waters right when I arrive on sight and release a few dozen sardines to get the Tarpon excited. Artificial lures such the Rapala Floating Magnum and Rapala Shad Rap are also good bait for Tarpon. Tarpon are outstanding fly fish material. They strike Furry Crabs and Tarpon Destroyers as well as the many “El Pescador” signature flys. Because Tarpon have very bony mouths the biggest challenge of catching this fish is most often setting the hook. If I am fishing with monofilament, when he strikes, I let the fish run for about 30 seconds before I nail him. If I am fishing with braided lines I can strike the fish a little faster. It’s May, so if you want to find me before 0700 in the morning, look out there in the openings in the reef that’s where you’ll see me and my side man “Carne Dulce”, up hours before dawn everyday, catching bait and hunting that mythical world record 300 pound Tarpon. Captain Dilzon Murcia is the project manager for Island Ferry and owner operator of Dilzon Charters, a sport fishing charter business. To catch the fish featured this week, and other large fish, call Dilzon at 620-6118 or drop by the Island Ferry office and schedule your next fishing adventure.